Robert Nesta "Bob" Marley, OM (6 February 1945 – 11 May 1981) was a Jamaican singer-songwriter and musician. 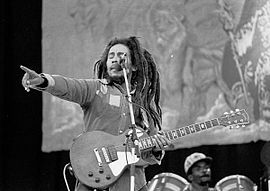 He was the rhythm guitarist and lead singer for the ska, rocksteady and reggae bands The Wailers (1964–1974) and Bob Marley & The Wailers (1974–1981). 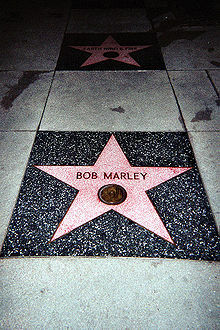 Marley remains the most widely known and revered performer of reggae music, and is credited with helping spread both Jamaican music and the Rastafari movement to a worldwide audience. Marley's music was heavily influenced by the social issues of his homeland, and he is considered to have given voice to the specific political and cultural nexus of Jamaica. 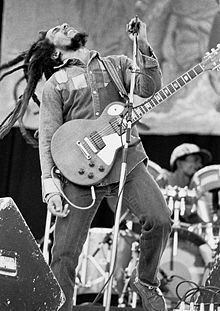 His best-known hits include "I Shot the Sheriff", "No Woman, No Cry", "Could You Be Loved", "Stir It Up", "Jamming", "Redemption Song", "One Love" and, together with The Wailers, "Three Little Birds", as well as the posthumous releases "Buffalo Soldier" and "Iron Lion Zion". The compilation album Legend (1984), released three years after his death, is reggae's best-selling album, going ten times Platinum (Diamond) in the U.S., and selling 20 million copies worldwide. His father, Norval Sinclair Marley, was a white Jamaican of English descent whose family came from Essex, England. Norval was a captain in the Royal Marines, as well as a plantation overseer, when he married Cedella Booker, an Afro-Jamaican then 18 years old. Norval provided financial support for his wife and child, but seldom saw them, as he was often away on trips. In 1955, when Marley was 10 years old, his father died of a heart attack at age 60.